San Francisco is consistently ranked among the top five romantic cities in the US. Water always makes a place more romantic and it’s doubly blessed with the Pacific Ocean on one side and the picturesque bay on the other. While in San Francisco there are the famed Chinatown, Golden Gate Bridge and Fisherman’s Wharf to see and the historic cable cars to ride. Now add some hilly terrain, fascinating, yet diverse architecture and dozens of the best restaurants in the world and it is no surprise why couples flock to this city on the bay for Honeymoons and romantic getaways. I’ll let you in on a little secret. There is a place on the other side of the Bay that doesn’t get as much press but is certainly worthy of consideration for romantic weekend. The city is Berkeley, well known for it’s University and the “hippie” movement a few decades ago. The University is worth a visit in its park-like setting as are the many cafes and interesting shops that fills a couple of the avenues within this compact and pedestrian friendly city. 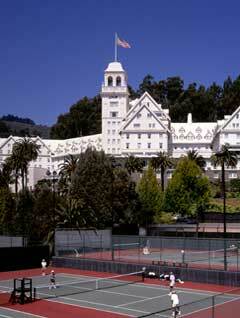 Overlooking the city of Berkeley and Bay is the castle-like Claremont Spa & Resort. 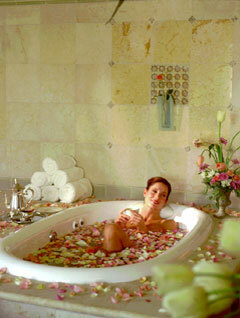 For over 80 years this grand hotel has pampered guests like you wouldn’t believe. The Claremont is not the sort of hotel you come back to late at night after a full day of site seeing. If you are staying here, you will want to spend most of your waking hours indulging yourselves in the luxury and riches this palace offers. tub. We soon discovered our twin bathrobes hanging in the closet. My terry-cloth robe was so warm and embracing that it was a very sad moment when I had to take it off to get dressed for dinner. I am glad we did go down to dinner as the four course meal served in Jordan’s, the Claremont’s signature restaurant was the perfect way to end the day. sauna. Next time we’ll try out the two outdoor pools and the tennis courts. Plan ahead for reservations. This place often books up weeks in advance.